Many people has read about witches, sorcerers, vampires, wandering spirits, and werewolves. While much of it is just that – fiction; according to Islamic teachings, there is an element of truth to the supernatural phenomenon. Some people may have direct experience of the horror out there, who have always had questions, but never had the right answers. First we need to understand what is meant by supernatural phenomenon. “The Supernatural” is what lies outside nature and hence outside science as well or beyond scientific understanding. Therefore, what is supernatural seems inherently mysterious and therefore sometimes scary. Generally human beings fear what they do not know. There many du’as or dhikrs (supplications or words of remembrance) from the Quran or Sunnah (prophetic teachings) for these things. Shielding oneself from the evil of magic or any other magic lies in adherence to Zikr (remembrance) of Allah (Morning and Evening Azkar), The Exalted, supplicating Him and placing one's confidence in Him. Furthermore, achieving such a protection does not lie in the use of what is Haram like Talisman (TAWEEZ) and incantations or by carrying impurities such as horse shoe, bones of a pig. In fact, these latter things increase the bad effects of magic and bring devils. But, it is regrettable that due to weakness of faith, many people feel awe of others, as they fear Allah or more. So, they hasten to push back distress through what increases it but they do not realize it.Thus, Dear Brothers and Sisters, you have to pray to Allah, seek refuge with Him and place confidence in Allah alone, and In-sha-Allah, nothing will befall except what He wills. 2) To protect oneself from magicians and devils with a fort that no one can get beyond, i.e. keeping on forms of Zikr day and night, morning and evening and so on, of restricted and unrestricted forms of Zikr. Such a way causes one to be with Allah and whoever is with Allah, He will be with him and nothing will harm him, Allah willing. 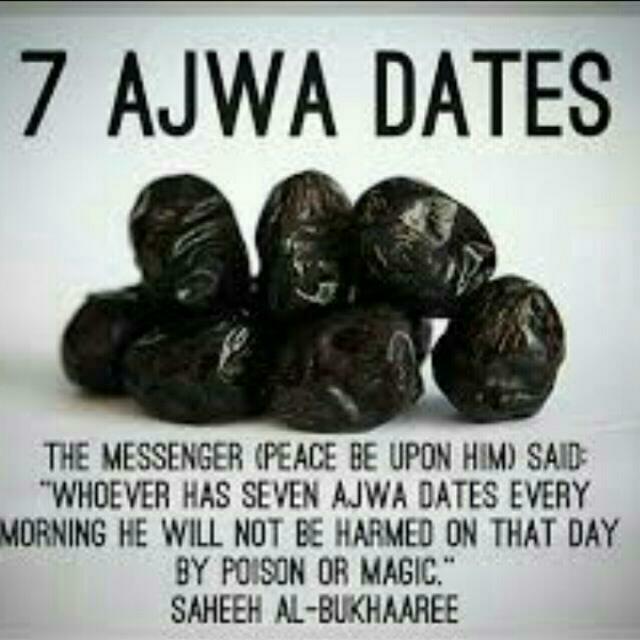 Eating Ajwa Dates:The Messenger (ﷺ) said, “Whoever has seven Ajwa dates every morning he will not be harmed on that day by poison or magic.” Sahih al-Bukhari (5445) (5768) (5769) (5779). And usage of other edible items proven from Sunnah like Olive oil, Honey, Kalonji, Zam-Zam water, leaves of senna etc. Finally! The best treatment for any magic is recitation of Qur'an and the authentic supplication taught by the Prophet Muhammadﷺ. In fact, the whole Qur'an is a remedy and a benefit for the one who believes in it. However, there are some Qur'anic portions, that have special qualities such as: Surah Al-Fatiha, Ayat al-Kursi (2:255), the last three Surahs of Qur'an, and the last two ayaath from the Surah of al-Baqarah (2:285-286), etc. Meaning: "There is no god but Allah, alone, without any partner. To Him belong the Kingdom and praise, and He has power over everything"
A'oozu bikalimaatil-laahit-taammaati min sharri maa khalaqa. Allahumma Rabban-naas Azhibil baas Shaafi waantash-shaafi, la shifa’a illa shifaa’uka, shifa’an la yughadiru saqama. · Ayatal Kursi- Ayath of the Throne (Surah 2 Ayath 255). · Recite 3 times after Maghrib Salah and Fajr Salah and 1 time after Zohr, Asar and Isha: Surah 112 Al Ikhlass, Surah 113 Al Falaq and Surah 114 An Naas and few more supplications proven from Sunnah.